In an increasingly polarized media environment, colleges and universities can be left somewhat adrift. They have a multitude of stories to tell — but who should tell them, and how? That is where specialized media platforms, including publications and outlets that connect with diverse audiences, have a unique role to play. As the media landscape evolves to target ever more specialized interest groups and audiences, colleges and universities can in turn reach those audiences by working with the outlets that serve them. As the U.S. looks ahead to a “majority-minority” future, colleges and universities ought to make an effort to broaden their outreach to diverse audiences, according to Alberto Avendano, Washington bureau chief of the National Association of Hispanic Publications. The Hispanic population is expected to nearly double by 2065, according to a 2015 Pew Research Center analysis. 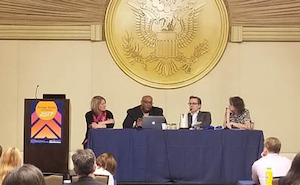 Speaking at a College Media Conference panel, “Sharpening the News Focus with Specialized Media,” in Washington, D.C. on Tuesday, Avendano said that colleges and universities can better reach emerging Hispanic college students through Hispanic-serving media outlets. At present, Hispanic students lag behind in terms of college enrollment and bachelor’s degree attainment. Only 17 percent of undergraduate and graduate students enrolled in colleges and universities today are Hispanic. Overall, 15 percent of Hispanics have earned a bachelor’s, compared with 51 percent of Asians, 34 percent of Whites and 21 percent of African Americans. Nevertheless, there are reasons for optimism. “Data shows that education is important to this community,” Avendano said. Today, more Hispanic recent high school graduates are enrolled in school than those who are not, and the Hispanic high school dropout rate continues to fall. Media strategies ought not only center around reaching prospective students. Colleges and universities have seen an upswing in unrest on campus over the last several years. Students are more socially active and issues of free speech on college campuses have become highly contentious, with public firings of controversial professors, as well as riots and violence in response to visits from controversial figures. Institutions should not shy away from coverage of more fraught events, according to Jamal Watson, executive editor of Diverse: Issues in Higher Education. “There are opportunities, particularly in this environment, to have a really helpful dialogue around some of the tense situations that are happening on campus,” he said. When pitching story ideas to editors, college and university communications officers should make a point of understanding publications and what audience they serve, Watson said. A college might want to place a story about an event or program on campus, but local events are more likely to pique an editor’s interest if they can be tied to broader themes. Avendano advised college and university communications officials to cultivate personal relationships with editors, to be persistent, to tailor pitches to specific publications and to provide a diverse set of sources.